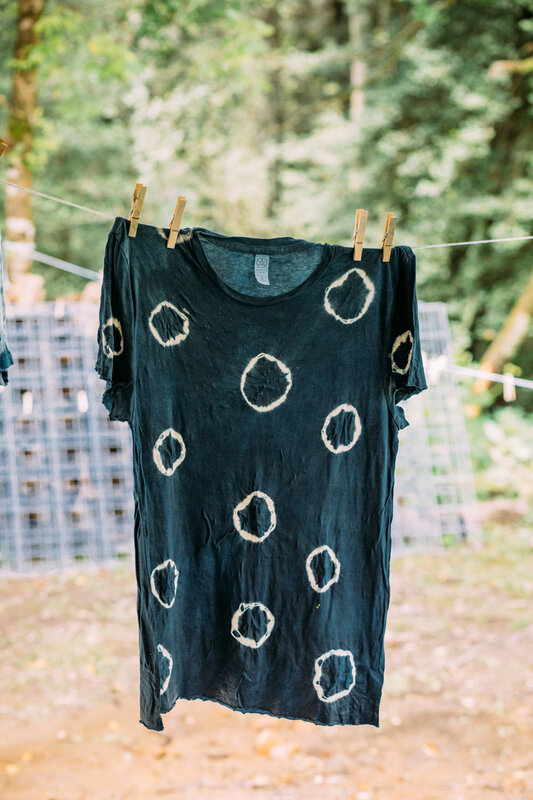 I had the indescribable pleasure of spending the last weekend at Fiber Farm, where Kacie (textile artist who owns and operates Fiber Farm) and Nadene Mairesse (designer and owner of Idyllwilde) and I collaborated on an Indigo Dye + Slow Stitch retreat. We have been planning this for months, with lots of e-mails and phone conversations back and forth. Through my different positions, I've worked quite a bit with a variety of artists, and I know how rare it is for 3 artists to work together essentially seamlessly, and I am so happy to have found that connection with these two powerhouse people. I am floored by Kacie's work ethic--she runs an alpaca farm, complete with donkeys and sheep, as a one-woman show, while still managing to create beautiful naturally dyed weavings and textile work, while traveling to shows, while teaching workshops--the list doesn't end. The most amazing part is that Kacie manages to do all of this while maintaining one of the most cheerful, generous dispositions I have ever encountered. She has a way of incorporating every aspect of her community into everything she does. She is such an inspiration to me, especially as I begin to shift into textiles as more of a profession, and I am so grateful for all of the chats we got to have over the weekend. It was extremely special to get to teach with Nadene. When I first began dyeing, Nadene is the one who taught me. She has always been incredibly generous with me in terms of sharing techniques, troubleshooting and answering my late-night text message questions. She has been integral in me finding my own voice within textiles and within teaching. Above everything, though, she's just a truly great friend. I encourage you to seek out the work done by these two artists--Kacie frequently teaches workshops, which can be found here, and sells dye kits and artwork in her shop which can be found here. Nadene teaches extensively and sells amazing womenswear and homegoods, all of which can be found here. In times like this, it's really easy to feel overwhelmed and think that a lot of things within the art and maker world are trivial. However, I think that making beautiful things is as important now as it has ever been--even more important now, potentially, and it's important to support those who do good work. 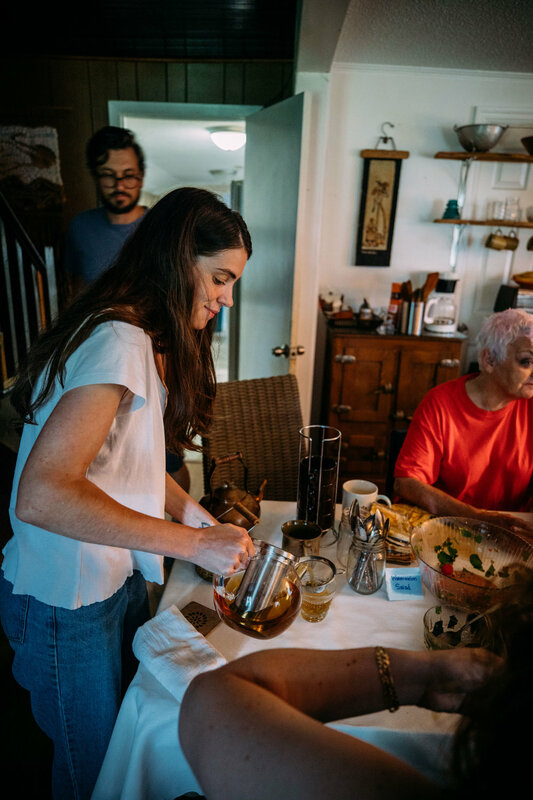 Day 1 was all indigo dyeing, with delicious meals interspersed throughout the day from chef Paige Thompson. I'm talking hemp pasta salad, blueberry trifle, sausage made from game from Kacie's family--it was really deluxe. We discussed the chemistry of the vats, as well as the history of indigo, and explored shibori techniques extensively. The night ended with Tim Higgins entertaining us around the bonfire. The most interesting thing about shibori and teaching shibori is that all of the students have the same amount of limited supplies in their arsenal, but the results are always so vastly different. It's pretty amazing to watch people develop their own voice so quickly in a medium they've often never experimented with before. Day 2 was all about stitching. Nadene taught basic construction techniques for piecing smaller pieces into larger stretches of fabric for wall hangings, or more utilitarian usages like totes and pouches, while I taught sashiko stitching techniques. Most of my recent workshops have focused heavily on indigo and shibori, and I always relish the opportunity to talk about stitching and sewing with groups of people. I view stitching as, first and foremost, a very personal act, and one that is done for yourself. It's time that you're devoting to mindfulness and inward thinking, and should be treasured. It's always a joy to watch students lose the burden of perfection and settle into their own stitching style, and see them lose themselves in the act of sewing. The weekend's magic would have been impossible without so many people, beyond just Kacie, Nadene and myself. Grace Boto and Abraham Rowe were on hand to help document the magic with their incredible photography skills. Susan Rowe managed to be a student in the workshop and also forage for absolutely incredible flower arrangements for our meals. Jess and Drew of Remedy stopped by to discuss their tea and herbal remedies with us, and let us all try samples of their delicious creations. Tim Higgins drove down from Nashville to entertain us all. Paige Thompson made five absolutely delicious meals for us. And all of the students, who traveled from all over the Southeast. The entire event was a lesson in egolessness. It was truly one of my favorite weekends, and will, in one way or another, inform all of my workshops from here on out. I can't wait to do it again! I'll add a few more photos down below--all of the photos are by Grace Boto. Follow her on instagram--she's truly a dream! Benji/Ash. Photo by Grace Boto. The Weekend's Group. Photo by Grace Boto. 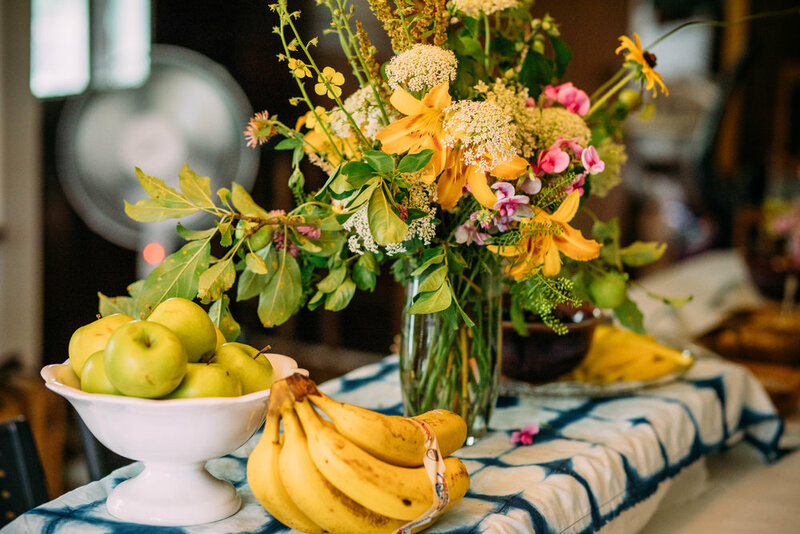 Foraged Floral Arrangement by Susan Rowe. Photo by Grace Boto. A small sampling of Paige Thompson's incredible meals. Photo by Grace Boto. Jess Rothstein of Remedy demonstrating and sampling teas. Photo by Grace Boto.